If you’re looking for ideas for climbing flowers to decorate a wall, trellis, or other garden feature, you have many beautiful blooms to choose from. We’ve put together a list of some of the most popular, and stunning, climbing flowers that you might want to include in a front yard, back yard, or patio garden. 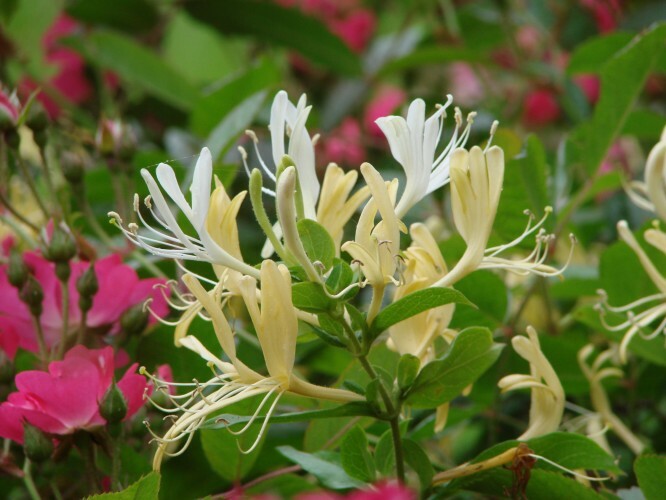 Honeysuckle is a fragrant climbing flower that seems to give off its strongest perfume at dusk. This flower will surely encourage most everyone who passes by it to dip their nose in for a big sniff. When they do, they’ll get a close-up view of one of the prettiest climbing blooms we know of. Lilac is an evergreen that blooms in mild areas. It’s a fast-growing climbing flower that provides a lovely display of flowers during summer, and sometimes into fall. We love training clematis to wind around posts, up and over archways, and through other plants. When clematis have climbed down a post or up an archway, they provide a blanket of color that’s gorgeous and unmatched. Trumpet vine is a climbing flower that blooms from late summer to autumn. It’s a sun-loving deciduous blossom that gives off unique orange-pink shaded, trumpet-like flowers that are more than interesting. They’re captivating! Wisteria is a romantic climbing flower that looks incredible on a sturdy frame like a solid trellis or pergola. This bloom needs the support of a strong structure because it carries a lot of weight at full growth, but it doesn’t look too heavy. Wisteria is perfect for gardens featuring delicate flowers as well as robust blossoms. These are some of our favorite climbing flowers, but we also love morning glory and golden hops. Do you have a favorite climbing flower? If so, feel free to let us know what it is in the comments below. Also, tell us where you grow your favorite climbing flowers.